This article converge on effects Rahu Ketu movement of 2017 for your Moon sign. According to Vakkiya Panchang Rahu Ketu transit happening on 27th July 2017 noon 1.47PM. Rahu is moving from Cancer (Karka Rashi) sign to Leo (Simha Rashi) sign and Ketu is moving from Aquarius to Capricorn sign. Now let us converge on effects this movement of Rahu Ketu for your Moon sign. One of the most famous women in politics can die. One of the most prominent ladies involved in public life can die. Increases contamination in food items. Death and illness of alcohol and drugs. Workers will have many obstacles. There are many crises for oil companies. There will be a lot of crises for gas and gas companies. For Aries sign, Rahu moves through the fourth house and Ketu transits from 11th house to 10th house during Rahu Ketu transit 2017. During this transition, Rahu is moving from fifth house to the 4th house (Sugasthanam). This will increase the good things in life. Rahu provokes for the luxurious life, so for some people, there might be circumstances of getting into debt. Ketu in 10th house will bring ups and down in work. It is good to be cautious in the workplace. While increasing the obsessiveness for luxurious things, Rahu sitting in a good place will not miss giving small health issues. Rahu and Ketu sitting in the 4 and 10th house (Kendhrasthanam) one can definitely expect good deeds. Guru Bhagavan will be very supportive after the Jupiter transit happening in September 12th, 2017. Jupiter Bhagavan coming to the 7th house for Mesha Rasi brings benefit and money through wife and for unmarried marriage will happen for sure. Though transit of Rahu and Ketu brings ups and down in work, later shifting of Jupiter creates talent to manage any kind of situation. It is good that you should reduce unnecessary expenses. Ashtama Sani will go away completely during Saturn transit happening at the end of the year. As a remedy for Ketu in work position, one can help in their power to an unemployed to get a job. On Sankataharasathurthi pray Vinayakar with Bermuda grass (Arugampul). For Taurus sign, Rahu is to pass through the third house (moves from 4th house to 3rd house) and Ketu traverses through the ninth house (from 10th house to 9th house) during Rahu Ketu transit 2017. Obstacles in the work will go away. Ketu (Significator of Wisdom) coming in 9th house (Bakkiya Sthanam) causes the increase in spiritual interest. Rahu coming to the 3rd house (Dhairiya Sthanam) causes will power to face any kind of thing boldly. Rahu transits from 4th house (Suga Sthanam) to 3rd house causes the change in the slow state to agility. Since Jupiter is transiting to 6th house in Rishabha Rasi, Jupiter transit 2017 happening on 2nd September 2017 causes the unnecessary fuss. Rahu and Ketu transit becomes favorable that causes competency to cope anything. At the end of this year, Saturn completes it is retrogradation and move forward to 8th house (Ashtama Sthanam) for you. Don’t worry the king planets Jupiter and Saturn is less powerful. Jupiter will be in the 6th house just for a year until that time it is definite that Rahu and Ketu will be supportive for you. Saturn impact will reduce when Jupiter becomes powerful, till that time patience is important. As a Remedy for Saturn helping disabled and feeding the Crow is good. The remedy for Jupiter is too forgiving the enemies is good since Jupiter in 6th house means hatred in town. If trouble comes patience is good. 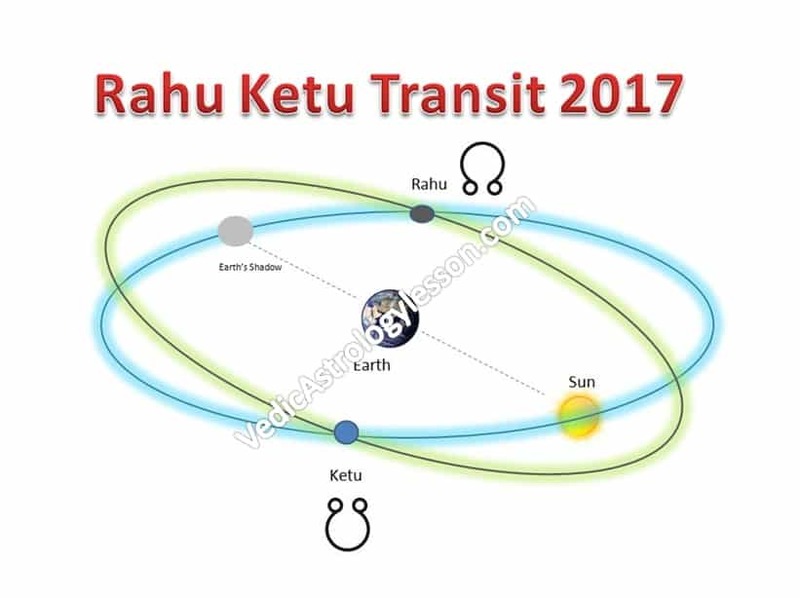 For Gemini sign, Rahu is transiting from 3rd house to 4th house and Ketu is transiting from 9th house to 8th house during Rahu Ketu transit 2017. You will face disgrace due Ketu in 8th house. Ketu in 8th house will cause uterus issue in women and stomach related issue for men. Guru becomes powerful to you after Jupiter transit in 2nd September 2017, Jupiter will be transiting in 5th house. Long lasting wishes of the heart will be fulfilled. People who thought of building a house will start building or who was having issues at the stage of finishing the house will be complete it. Rahu in 2nd house will give the income for the same. Jupiter in 5th house aspects the 11th house (Laba Sthanam), so progress in income is definite. Praying to Vinayaka (Lord Ganesha) is good for Ketu in 8th house. Saturn transit happening at the end of the year is transiting to 7th house (Kalathira Sthanam), so both husband and wife lighting gingelly oil lamp together for planet Saturn are special. For Cancer sign, Rahu is transiting from 2nd house to 1st house (Ascendant) and Ketu is transiting from 8th house to 7th house during Rahu Ketu transit 2017. Ketu transiting from 8th house (Ashtama Sthanam) to 7th house is good. After Rahu Ketu transit 2017, both plants become the favorite place. Rahu and Ketu sitting in 1, 7th house is better than the placement of 2, 8 house. Health will get better, Ketu in 7th house will cause the only obstacle in marriage. If the 7th house is strong in the horoscope that obstacle will also go away. Rahu in 1st house will cause the increase in income, but Ketu in 7th house will give expenses matching their own. It is your talent to change it as good spending. Jupiter comes to the 4th house to the Kataka Rasi after Jupiter transit happening on 2nd September 2017. Jupiter aspects on 8, 10 and12th houses cause good progress and peaceful environment in business as well as the workplace. Saturn transits to 6th house for your Rasi at the end of the year. This will give wonderful results. Jupiter in 4th, Rahu in the 1st house (Rahu conjunct Moon) – Rahu might give small health issue to the mother. So taking care of mother is the good remedy. Worship Jupiter on Thursday is the special remedy for Jupiter in 4th house. For Leo sign, Rahu is transiting from 1st (Ascendant) house to 12th house and Ketu is transiting from 7th house to 6th house during Rahu Ketu transit 2017. Ketu in 6th house will make way to get out of debt. If there are any cases/disputes pending, it will end favorably to you. Ketu in 6th house represents Rana, Roga (disease) and Sathru (enemy). Your enemies will vanish. Your debt will go away and health will improve. The person who wanted to visit abroad will get a chance now due to Rahu in 12th house. 12th the house represents long distance traveling when Rahu in westerly sign Katakam. Those who have the planetary position to travel abroad in their horoscope will definitely go during this period. Simha Rasi people will go a lot of traveling during this period! Rahu in 12th house will cause waste of money too. Careful! It is your talent to change it as good spending. Ketu transiting from 7th to 6th house will remove the obstacles in the marriage. Jupiter comes to the 3rd house after Jupiter transit 2017 happening on 2nd September. Though Jupiter in 3rd house gives fewer benefits, its aspects on 7, 9 and 11th house will cause gain through wife, mutual understanding between husband and wife. Jupiter watches the 11th house (Bhagya sthan and Labh sthan) will definitely give income and profit. But to get that many attempts need to be taken due to Jupiter in the 3rd house. As a remedy for Jupiter in 3rd house buy food for low-wage workers other than that temple worship can be done as per everyone’s wish. Ketu transits from 6th to 5th house for Virgo Sign (Kanni Rasi) and Rahu transits from 12th to 11th house. Rahu traverses through 11th house (Labasthanam) one can expect a very big hike in financial status. The Shadow planet Rahu transiting from 12th house (Ayana Sayana Sthanam) to 11th house now on good sleep will come and health will improve. It is good that Ketu coming to the 5th house (Poorva Punya Sthanam). The 5th house is the sign of subconscious mind, intelligence, and thinking. The presence of Ketu in this place gives the power to think and act according to your thinking. Jupiter transit happening September is favorable to you. Jupiter is entering the 2nd house during Jupiter transit 2017 for Virgo happening at 2nd September for Kanni Rasi. Planet Jupiter becomes favorable to Virgo sign after transit. Jupiter in 2nd house will bring happiness to the home. Guru comes to the 2nd house which represents Family, Money & Wealth Kudumba Sthanam, Dhana Sthanam what else to say!! Definitely, money will come in anyways, your horoscope will decide how. Saving that as per the proverb “Make hay when there is sunshine” is good. Currently, Saturn in 3rd house is also favorable to you. Tejas will appear in your face. This year all the planets are favorable to Kanni Rasi!!! Worshipping their family Deity or their favorite Deity will be good. 5th house denotes family God and Ketu is coming to that place, that is why I mentioned worship of family God. Don’t think that blabbering something about the remedy, grateful family god worship will save you. For Libra Sign, Rahu transits from 11th to 10th house and Ketu transits from 5th to 4th house. Business will grow due to Rahu in 10th place. Whatever may be the business growth is sure. But Ketu in 4th house means need to take care of the health, Ketu coming to Suga Sthanam will cause illness, should take more care in health. The 4th house denotes mother, hence some people might face problem in their mother’s health. Because of Ketu in 4th house, there might be the delay in building the house and vehicles might break down. But Rahu in 10th house will give the increase in income. You will be relieved from debt. Jupiter comes to your Rasi which is happening at of the year. Jupiter aspects on 5th, 7th & 9th house improve your children’s livelihood. The relationship between husband and wife will improve. You will be the reason for your family members happiness, but Jupiter in 1st house will cause unnecessary wandering in work. Vinayaka (Lord Ganesha) worship is necessary for Ketu in 4th house. On Sankatahara Chaturthi pray with Bermuda grass (Arugampul). Lord Jupiter will trouble you to make the future special. This year try as much and utilize the opportunities without missing it. Then when Jupiter enters the 2nd house, he will give the benefit in 2 folds. For Scorpio Sign, Rahu transits from 10th to 9th house and Ketu transits from 4th to 3rd house. Ketu moving out from 4th house (Suga Sthanam) will improve the health. Rahu in 9th house will improve the standard of living. There is saying that nobody can give like Rahu! Nobody can spoil like Ketu! Rahu in 9th house (Bakkiya Sthanam) will not miss giving pleasure what you deserve as per your horoscope. Jupiter transits to your 12th house for your Rasi which is happening at of the year. Being Viraya Guru money which comes will be wasted. Sleep deprivation will be there. 7 1/2 Saturn (Sade-Sati period) is now Jemma Saturn so it will cause unnecessary concern and roaming. Don’t worry Saturn transit happening at the end of the year will be 7 1/2 Saturn’s last part changing into Padha Sani so it creates grip in life. Though Saturn and Jupiter are in unfavorable to you, Rahu and Ketu will be strongly on your side. On Thursday worship Jupiter is good. Since Jupiter is lord of 5th house (Purva Puniyathipathi) for your Rasi, he will always protect you. Ketu transits from 3rd house to 2nd house and Rahu transits from 9th house to 8th house for Sagittarius Sign. Ketu and Rahu position in 2nd and 8th house will bring some challenges at home and reflects some Karmic backlog. Rahu in 8th house will cause pain in abdomen for some people and there is a chance that women may have uterus related issues. Since it is a Sade-Sati period, treating even the small health issue is good. Don’t worry about unfavorable placement of Rahu Ketu and Saturn. Your Rasi lord Jupiter will be supportive to you. After Jupiter transit, the planet Jupiter is moving to the 11th house for your Rasi. Jupiter aspects on 3rd, 5th & 7th house will plunge your family members in happiness. Also, the impact of 7 1/2 Sani (Sade-Sati) will reduce. Though Ketu is in the 2nd house (Dhana Sthanam), But Jupiter in 11th house will give income. But savings is doubtful. Not to get any loan is best. Only Jupiter transit happening during 7 1/2 Saturn is favorable. Do not shake much till the period of Jupiter in 11th house, whatever comes use it wisely. Whether it is money or work, whatever it is. When Jupiter is weak in the 12th house holding yourself now will give hand. Performing remedy for Rahu and Ketu is necessary. Worship Rahu and Ketu is in nearby Siva Temple is better. Ketu transits from 2nd house to 1st house and Rahu transits from 8th house to 7th house for Capricorn Sign. Rahu who gives away pleasure has another name Bogakarakan. Rahu in 7th house will give luxurious life and prosperity in wealth. Since Ketu comes in Rasi there might be small health issues, absent-mindedness. Moon conjunction with Ketu will cause spiritual interest. You will undertake some restrictions in food. Jupiter transit happening in 2nd September 2017, For Capricorn Sign Jupiter, is moving to in the 10th house. From there Jupiter aspects on 2nd, 4th & 6th house and Rahu movement in 7th house will bring wealth. Saturn transit happening at the end of the year becomes 7 1/2 Saturn’s starting period of Viraya Sani. Jupiter in 10th house joining with 7 1/2 Saturn starting stage will pave the new way in your business. Utilize that in a good way. Jupiter coming in Karma Sthanam (10th house) will give unnecessary traveling in business, other than that no big impact. Worship of Lord Ganesha will bring good for Ketu. Adding a different kind of lentils in food is good. Do not get frightened by 7 1/2 Saturn. A person will definitely face good breakthrough in life when 7 1/2 Saturn happens. Ketu transits from 1st house to 12th house and Rahu transits from 7th house to 6th house for Aquarius Sign. So far you have suffered body pain and fatigue kind of things due to Ascendant Ketu ( Ketu in Rasi). After Ketu transit to the 12th house, you will be relieved from those body discomforts and will be healthy henceforth. Generally, Aquarius sign is also one among the Rasi who will get more benefits out of this Rahu – Ketu transit 2017. Rahu, Ketu will do more good when they come in 6, 8 & 12th house (Maraivu Sthanam). You will see very big financial gain during this period. Jupiter also becomes more favorable for your Rasi after Jupiter transits happening on 2nd September. What else to say, you’re going to rock!!! Jupiter will be transiting in 9th house for Kumba Rasi, this is a wonderful placement. Jupiter aspects on the 1st, 3rd and 5th house, Jupiter is going to keep his eyes on your Rasi. Also, sight on Purva Puniyasthanam 5 and Veeriyasthanam 3rd house will strengthen you. At the end of the year Saturn transit happening in the Labasthanam 11th house for your Rasi, money will come abundantly. Your earnings will be large. So far 8th house Jupiter might have given unknown mental worries, feeling of fear. The moment has come for all those to go away. This year all the planet transits are favorable to Aquarius Sign!!! Worship God to thank, that is enough. Whatever comes according to “Make hay when there is shine” use it in the proper way to save. Ketu transits from 12th house to 11th house and Rahu transits from 6th house to 5th house for Pisces Sign. According to Vedic Astrology, it is a general rule that sinful planets in 11th house will do good. Hereby Ketu transit in 11th house is good only. Rahu in 5th house will create high intelligence. The especially mind will be sharp. The standard of living will improve. Rahu in 5th house will increase the thought of doing donation and charity. Ketu in 11th house will bring good through elder brothers. 5th house denotes intellectual sharpness. Rahu staying there causes especially progress in education. Jupiter transit that occurs on 2nd September will be unfavorable to Meena Rasi. Jupiter is moving to the 8th house, which is not a good place for Jupiter. He will give the feeling of fear and mental worries. Though there is no support from Jupiter, Rahu in 5th house will give mental strength and managing capacity. Jupiter in 8th house is looking in 12th, 2nd and 4th houses will bring income. School going children will do well in their studies. But the feeling of fear will be there. Talk supportively and encourage the Meena Rasi children. Though Jupiter is weak, Rahu and Ketu will guide in your side strongly. Worshiping Jupiter on Thursday is good. There is no compulsion to go only on Thursday, going and worshiping in Jupiter Hora on any day is fine.